Eli Broad, the American magnate, once quipped, “A real collector does not sell.” Having spent nearly four decades as an art dealer specializing in antique Oriental rugs, I have had the privilege to work with hundreds of clients and can add that, while Broad’s comment is generally true, the personalities and habits of the modern collector are less readily defined. 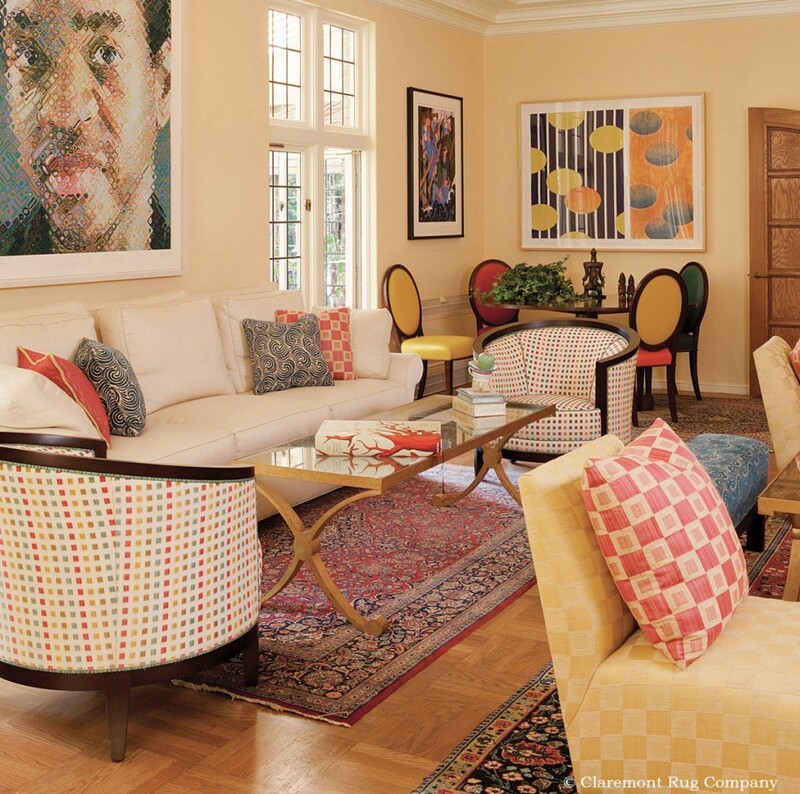 An eclectic combination of a connoisseur’s art collections includes antique Caucasian tribal rugs, modern paintings and Asian art. Over the years I have been a willing audience, given a front-row seat from which to witness what quickens the pulse and piques the attention of any impassioned collector. I find that the common threads in collecting “strategies”—that is, discernible patterns as to what is pursued and purchased—can be broken into three categories, and I define them here as the Aesthete, the Connoisseur and the Pure Collector. Whether we collect stamps or Pre-Columbian Art, American Impressionist paintings or sports memorabilia, items appropriate to one’s preferred genre were often created within a clearly defined place and period, and are in limited supply. The driving knowledge that each acquisition is an elusive, exclusive artifact discovered within the depths of a larger, dwindling whole is what I believe to be the common element that fuels the passions of all collectors. But a deeper understanding of how and why we collect helps, I believe, to derive the greatest sense of pleasure from the act itself. This lively decor is driven by an impassioned aesthetic for contemporary art and fine mid-20th-century Persian carpets. The Aesthete buys works of art to create a stunning individual home. Not willing to have treasures languish unseen, the Aesthete chooses only those pieces—often with precise placement in mind—promising to work in copasetic harmony with other elements found within the intended space. The aesthete collector is someone for whom a stirring aesthetic is not merely desirable but paramount to his or her lifestyle. The acquisitions of an Aesthete are celebrated only after careful deliberation about how they may be viewed and appreciated. This type of collector can walk away from a stunning piece that would undoubtedly sway many others, simply because it does not work within the desired aesthetic. For Aesthetes, it is not merely the thrill of the chase; above all it is the inherent beauty of the world around them that moves and motivates them as collectors. 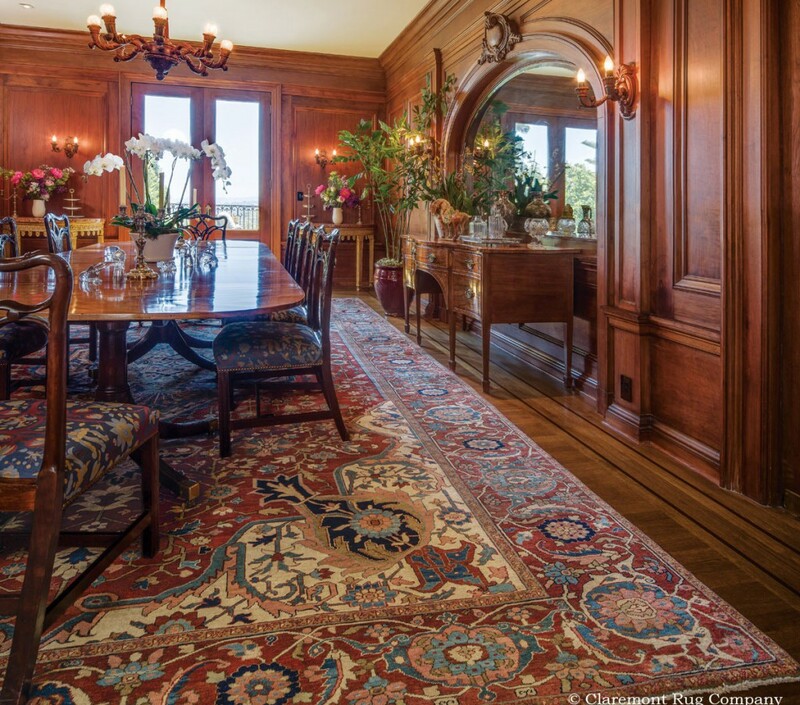 An oversize Persian Serapi carpet from the 3rd quarter of the 19th century graces a traditional dining room. This Aesthete collector has also acquired many antique and contemporary glass pieces as well as Tang Dynasty wooden horse sculptures. A Connoisseur’s desire is to collect the most covetable offerings of any given genre, even if it means his or her surroundings must be stretched or changed to include the new acquisition. Overlapping with the Aesthete, the Connoisseur creates a memorable home surrounded by art forms of choice, but the Connoisseur is comfortable with having part of a collection in storage and takes great delight in changing out pieces. 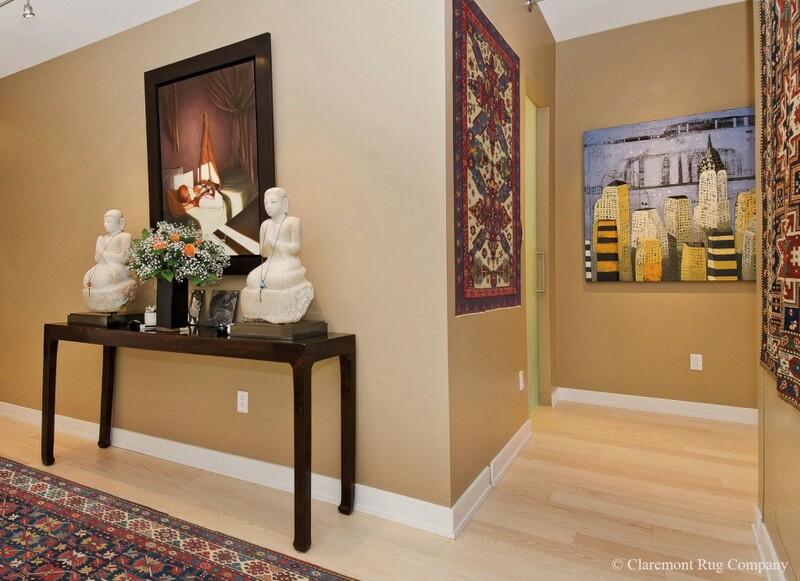 The Connoisseur’s home can evoke a changing display as in an art museum; the approach is more curated. For instance, the connoisseur of antique rugs often has numerous dedicated storage chests and closets, and sometimes entire rug cellars, from which to draw. For Connoisseurs, knowing that they have identified, sought out and—perhaps most importantly—obtained exquisite examples for their collection is irresistible and alluring. During my career, I’ve worked with a great many Connoisseurs, consulting with them to fine-tune the focus and reach of their collections, assisting them in honing impressive inventories encompassing the broader genre into more succinct portfolios, and helping them showcase those pieces that epitomize excellence within more precisely defined fields. For the Connoisseur, regardless of context, only great examples will satisfy. 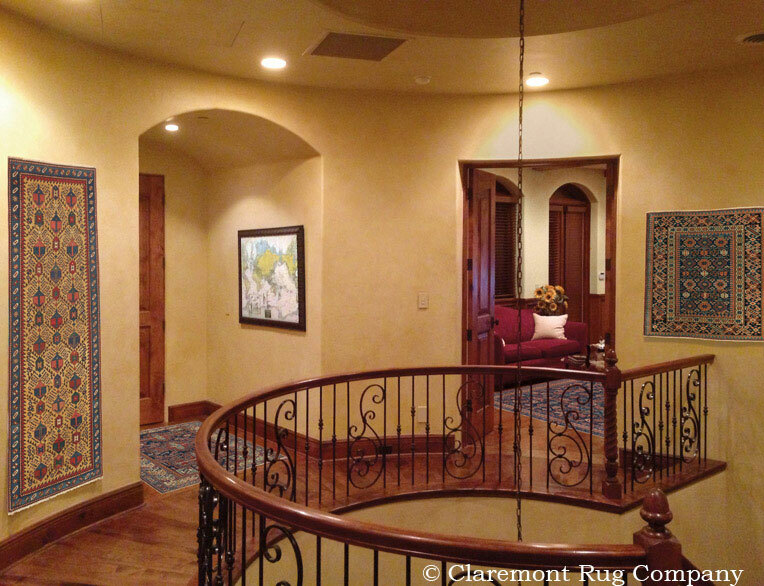 A Connoisseur couple’s home presenting their love of art and beauty with 19th-century Persian and Caucasian rugs and an antique map. Unlike the Aesthete or Connoisseur, the very existence of the Pure Collector’s noteworthy acquisitions—regardless of physical location and whether or not they will go on display in the foreseeable future—is enough to satisfy. The Pure Collector is, perhaps, the most unadulterated type of art gatherer I see in my business. The mark of the Pure Collector is a quiet dedication to the collection itself. They are less swayed by any personal aesthetics and less apt to surround themselves with their treasures. The Pure Collector is dedicated to filling specific voids, real or perceived, within a collection and may have no limits to quantity. Some become fascinated by studying variations in the many pieces they own: the differences in the tannins of Cabernet Sauvignon vintners; the subtle nuances of Burmese rubies; the changes in grillwork from different car companies over the years; or recognizing each of the 85 subgroups of Caucasian Oriental rugs. Some become true experts in their field of focus. Unyielding in their desire for excellence, Pure Collectors are diligent in their search for pieces of great rarity and artistry. Pure Collectors are typically more prolific in their acquisition than either the Aesthete or the Connoisseur. Indeed, many build extremely large, world-class collections that, while seldom out of mind, are often held safely, mostly out of sight. In fact, some are content to view most of their rugs solely online or in dedicated photo album, while others make a habit of viewing each piece they own once a year. In fact, at Claremont Rug Company we have a program for Pure Collectors to store their surplus inventory and periodically rotate them with their pieces in use. Defining one’s style as a collector, it seems, is an evolution born of attraction and honed by experience. In looking at the three styles of collectors, one can, of course, see many overlapping areas. Pure Collectors can also take great pleasure in surrounding themselves with the products of their passion, while there are Aesthetes whose acquisitions are of the highest, most stellar quality. There are Connoisseurs who collect everything from cookie jars to Ming vases with the same, unyielding attention, and there are preeminent fine art Collectors with an unabashed affinity for comic books. There are no rules, per se, in collecting. There is only direction as determined by one’s own, unique passions. Ultimately, you may question why it matters.  The elucidating differences tend to lie deep, revealing themselves slowly, but understanding what motivates my clients helps me in assisting them to define and to discover those pieces that will most thoroughly please them. Understanding your own collecting style more deeply might help you determine whether that piece you are contemplating is really the correct acquisition. While the Aesthete may be enamored with a particular rug because of its rich color, the Connoisseur may covet the same piece as a pristine example of a rarely seen hue, and the Pure Collector may desire it as a rare, one-of-a-kind specimen featuring a dye color long lost to the world. One rare rug and one common element found equally covetable by three different collectors, yet each defines the basis of that desirability so very differently. Therein lies the delight of discovering the many fascinating facets of the modern-day collector. Vive la différence.